I am knitting the sweater with the same size needles I used for the gauge swatch that had the proper measurement, but I still feared that my sweater was knitting up too small. It just looked too small. Oh, I know that cables draw in a lot and will usually relax some when the item is washed; how much depends a lot upon the yarn, of course. 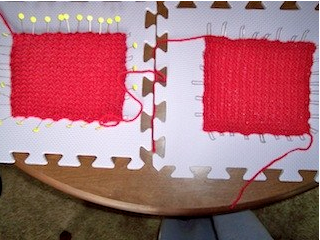 But my gauge swatch is just the filler stitch, not the cables. 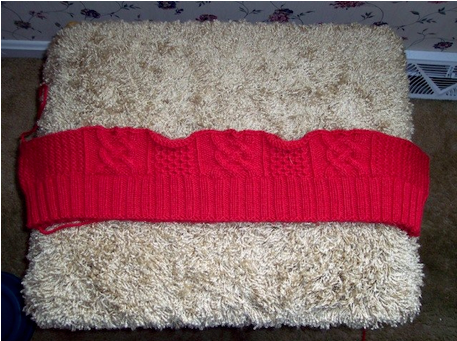 And the swatch was knitted flat while the sweater is being knitted in the round. 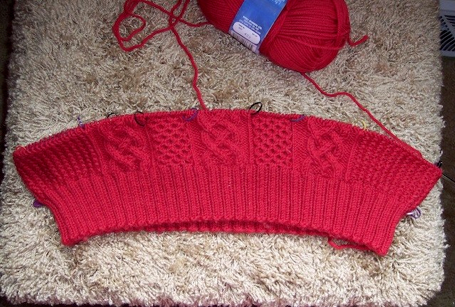 One’s gauge can vary between knitting back and forth and knitting in the round. So I was feeling a little uncomfortable at this point in the knitting. What to do? There is a fairly simple solution to my dilemma–bind off the sweater-in-progress, wash and block it, then measure to see if it is big enough. 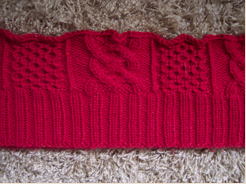 If it is the right size, just undo the bind-off and keep on knitting, confident that the sweater will be the proper size when finished. If not, rip it out and start over again either using a bigger needle or adding a few stitches in order to get the proper size. So that’s what I did. I bound off the sweater, washed and blocked it, then measured. And guess what! I should have trusted the swatch. As you can see, the sweater is significantly bigger after washing and blocking. The size is fine. I had a similar experience when I was knitting the boy’s Traditional Gansey. The sweater looked to be way too small, and when I tried it on him while it was in progress, it was rather form-fitting. 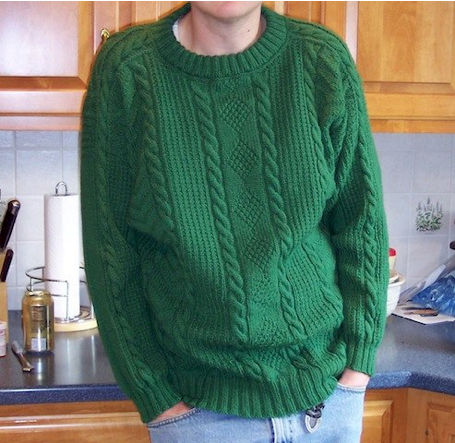 But I had washed and blocked my swatches, measured them carefully, double-checked my math, and I was quite certain that the sweater would fit perfectly after it had been washed. And it did! So why didn’t I trust my St. Enda swatches? Probably because I ignored the most important lesson I learned from Janet Szabo’s FLAK workshop. When swatching for a sweater with cables, include all the different cables in your swatch, not just the filler stitch. This accomplishes two important things. One, you, the knitter, become familiar with working all of the cable crossings in your sweater and, two, you know how the cables will behave after you wash and block the sweater. With some yarns, cables will flatten out a lot after washing; with others, the cables will still “pop” after washing.